The authorities have warned people using internet services commercially provided by operators in neighbouring countries to refrain from doing so as it violates Lao law. Are you somewhere in Asia and experiencing slower-than-usual Internet speed lately? If so, you might not be alone, and it’s all because of the really rough weather. A recent report said the two powerful typhoons – Hato and Pakhar – which struck Hong Kong late last month have broken four submarine cables in the crowded Asian sea-lanes and that it ..
Internet users will be able to access online data via smartphones anywhere with mobile telephone signal, including remote areas, through a new system which doesn’t require continuous connection to the internet. New technology set to be introduced will allow smartphone users to access data connections with only a …. The NBTC and Laos’s Ministry of Post and Telecommunications (MPT) signed an agreement in February to cooperate on telecoms cooperation issues. Last month, Facebook launched a free video calling feature in its Messenger app so you can set up face-to-face conversations with your family and friends with just one tap. Facebook Messenger’s video calling feature started in 18 countries, including Belgium, Canada, Croatia, Denmark, France, Greece, Ireland, Laos, Lithuania, Mexico, Nigeria, Norway, Oman, Poland, Portugal, the U.K., the U.S. and Uruguay. Chrome and Opera Beta – Works with Lao! As a result of some new technology implemented, Google Chrome and Opera now have beta versions of their desktop and mobile Internet browser software that works well with Lao. Laos has issued a new law prohibiting online criticism of the government and the ruling communist party, according to state media, setting out stiff penalties for netizens and Internet service providers who violate controls. The 28-point decree makes Laos the latest Southeast Asian country to implement tough new laws governing use of the Internet. Under the decree, which will take effect on Oct. 1, netizens will face criminal charges for publishing …. LibreOffice, an open source office suite, is getting ready to release the upcoming version 4.3, bringing many new improvements. One thing that you may not be aware of is that for some time now (since version 4.2), LibreOffice has native word detection support for Lao, a difficult feature to implement correctly. This allows for dynamic word-breaking, spell-check, and word count features in Lao that traditionally have not been possible with most office suites in the past without …..
J&C Services is growing fast …. in order to keep up with the increasing traffic on our website we decided to move www.jclao.com to a top-notch, fully managed hosting provider. Our customers & visitors as well as our advertising sponsors will benefit from faster loading pages in a fully secured environment. Our host offers automatic security updates, daily backups, one-click restore points, automatic caching, top-tier security, and many more features. Now we dare to say that our website has become hacker proof ! Our website always being accessible and offering high speed is …. Internet users who use social media such as Facebook to circulate false information or any use targeting to disrupt social order or undermine security could have their accounts blocked, a minister has said. The technical officials are working in an attempt to block false information and some accounts that target to tarnish the reputation of individuals, disrupt social order, and tarnish the image of the country and the government. Facebook has rapidly become popular among users worldwide and in Laos. The number of Lao Facebook users has more than doubled from …. Telecommunications companies in Laos need to increase the number of towers to improve high-speed third generation (3G) internet services for customers. According to a 3G engineering official from a telecom company, who spoke to Vientiane Times yesterday and didn’t want to be named, slow 3G internet in Laos was due to a lack of capacity, meaning there is a lack of towers to serve customers. “It requires a large amount of money to enlarge the 3G service infrastructure and this is what some …. A few clicks of the mouse, and your webcam is activated and ready to be used. But have you considered the possibility that someone else could be watching you through your own webcam? The thought of this probably sends chills down your spine, and it should, as this is very real- and extremely creepy. Hackers utilize a type of software called remote access tool (RAT) that allows them to remotely access a computer as if they were physically there. Though RATs were designed for legal purposes, like allowing a technician to remotely access a user’s computer to troubleshoot problems without having to physically be there, hackers exploit this to ….. The government is drawing up regulations to govern online social media in a move to ensure internet users utilise social networking websites in a constructive manner, a senior official has said. New regulations that would enable officials to check on those posting incorrect or inappropriate information and photos were expected to come into force this year. Those found posting incorrect or inappropriate information or pictures would be warned and, if the case lead to serious consequences or was regarded as sensitive, the offenders would be …..
Have a box of tissues ready before watching this incredible advertisement from Thai communication provider TrueMove H. The three-minute segment warmed the hearts of thousands since being released and serves as a powerful reminder of the power of being kind without expecting something in return. The state-owned telecom operator Lao Telecommunications Company (LTC) will officially launch Long Term Evolution (LTE) technology or its 4G service in Laos within the next month. 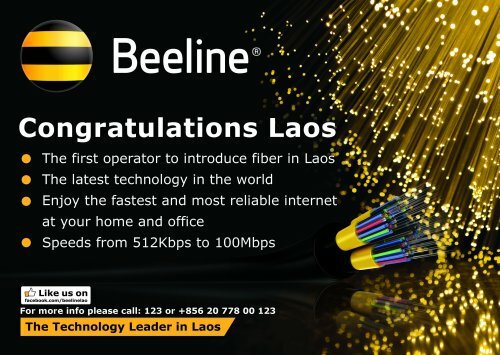 “We will initially launch the 4G technology at 60 base stations in Vientiane. After this, we will expand the service to the provinces,” the LTC Director General Mr Thongsay Sanexaya said on Wednesday. Your email account is not accepting your password. Your friends are asking how you got stranded in London and whether you got the money they wired. Your mother wants to know why you are sending out emails with nothing in it, but a link. Surprise, your email has been hacked. A Lao font and keyboard are ready for use on android and iPhone operating systems (ios) this year after the Ministry of Post and Telecommunications and ICT companies joined forces to make this possible. Laos will develop a programme to allow Apple, Google, Samsung, Nokia and Microsoft to permanently incorporate the Lao font and keyboard into their systems. “60 to 70 percent of ICT users have requested a Lao font for their mobile, especially smartphones, tablets and ios, so the ministry recognises the importance of using our language with this technology. They have worked with these companies to include it in their systems”…..